The family Oxyopidae contains 448 species of spiders in 9 genera. They have a worldwide distribution but are (like so many groups) most speciose in the tropics. I had never encountered one personally before traveling in Central and South America, but it turns out we have two species in the genus Oxyopes in Canada! A female Oxyopes salticus (one of the two lynx spider species found in Canada) sporting impressive (sharp-looking!) spines on her legs and the characteristic hexagonal oxyopid eye arrangement. Photo by Thomas Shahan, licensed under CC BY-NC-ND 2.0. Members of this family are generally diurnal hunters, with keen eyesight (for spiders) and great agility. 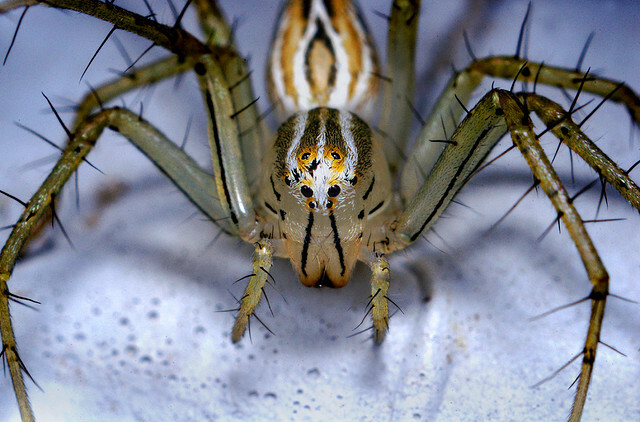 Like the cats they are named after, lynx spiders often stalk and pounce on their prey. 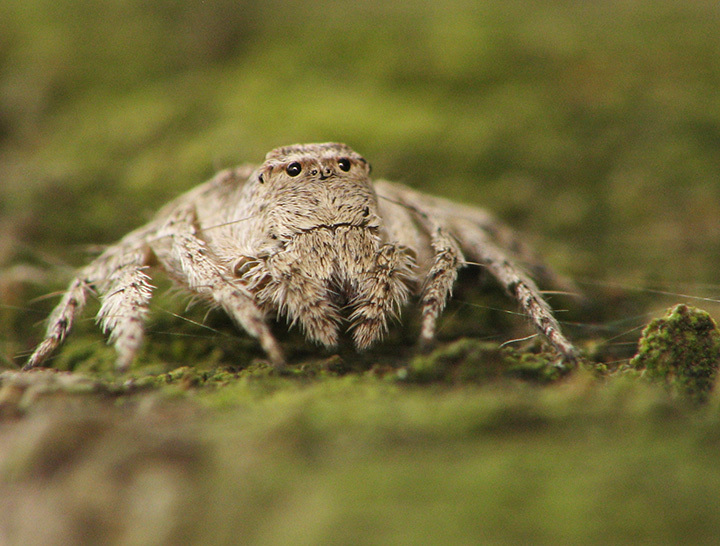 They are proficient jumpers, and some might even be mistaken for a salticid at first glance. This one (click the link, it’s worth it!) looks like it might actually mimic a jumping spider. Some oxyopids are ambush predators, staking out flowers and waiting for unsuspecting insect visitors. 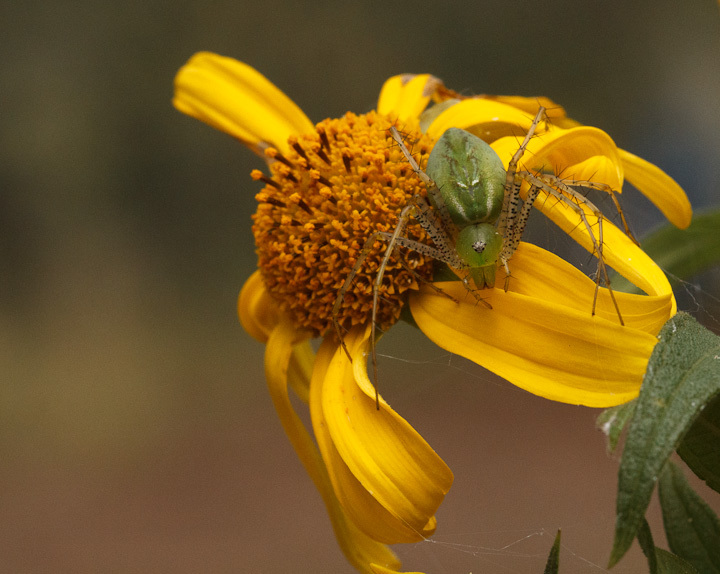 Like crab spiders (Thomisidae) with similar behaviour, green lynx spiders have the ability to slowly change colour (the process takes several days) to match the background they are sitting on – usually flowers. Like the disparate forms these spiders take – compare the Peucetia viridans above with the Hamataliwa grisea below – they also have fascinating variety in their habits. 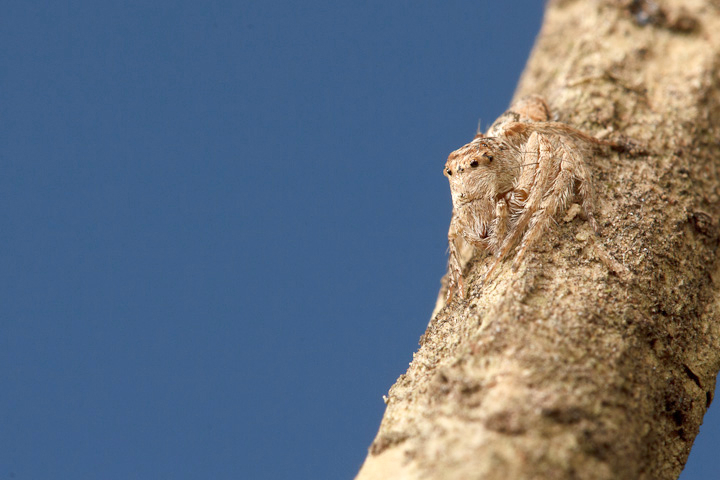 While most lynx spiders are cursorial hunters that don’t use silk for prey capture, there is one web-building genus (Tapinillus), including a social spider species that engages in communal web building and cooperative prey-capture! Peucetia tranquillini is a wanderer that invades the orb-webs of female Nephila clavipes, locating and preying on courting males by responding to their vibrations, and sometimes vibrating the web themselves, apparently to attract a resident spider (a possible example of aggressive mimicry). One individual was also found residing in the tangle-web of a brown widow (Latrodectus geometricus) for several days, capturing prey caught in the web, and even stealing prey captured by the web owner (kleptoparasitism). Spiders in the genera Oxyopes and Peucetia are members of what I like to call the centimetres high club: they mate in the air, hanging from a silken thread spun by the female. In one species, the male wraps the female in a silk ‘bridal veil‘ before copulation. 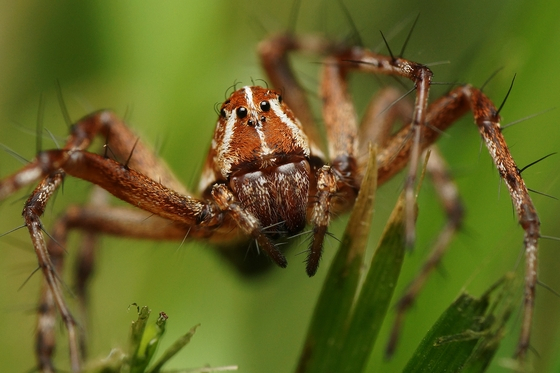 Oxyopes scalaris, the other lynx spider that can be found in Canada. Photo by Kyron Basu, licensed under CC BY-ND-NC 1.0. Mother green lynx spiders guard their egg sacs and newly emerged spiderlings, and will fiercely defend them by spitting venom. While the spitting spiders (Scytodidae) shoot a deadly combination of venom and silk out of their fangs to capture prey, this seems to be the only spider with venom-spraying defensive behaviour. 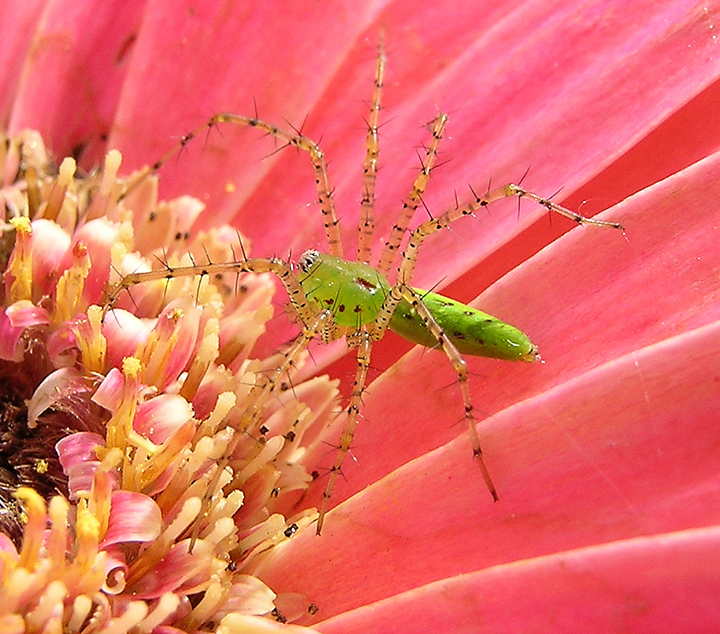 Erin McKiernan on green lynx spiders. Bug Eric on striped lynx spiders. The green lynx as a featured creature, from the University of Florida.